Have you ever wondered what color experienced insulator collectors call each item when dealing with each other? There's Aqua, Brooks blue, Sky blue, Turquoise blue, Light blue, Medium blue, Dark blue, Cobalt blue, Sapphire blue, and it goes on and on. That's just the blues, there's also greens, amber's, yellows, purples, and many many others. Look at your insulator, what color would you call it? Using terms so that other collectors will know what you're talking about when describing the item. With this CD you can see actual pictures of just about every known color that insulators exist in. Compare your insulator with the one's pictured and quickly and easily you can describe the color correctly. All pictures in this CD were taken with the same lighting conditions, same camera, and I have 35 years experience in the insulator hobby, and printing trade, dealing with color everyday. It will help beginning collectors as well as advanced collectors. There are over 150 photographs of insulators in just about every color ever known. There are also many pages featuring groups of insulators where many of the known colors are photographed side-by-side so you can compare them with each other to determine what color that particular Insulator actually is. (See pictures). 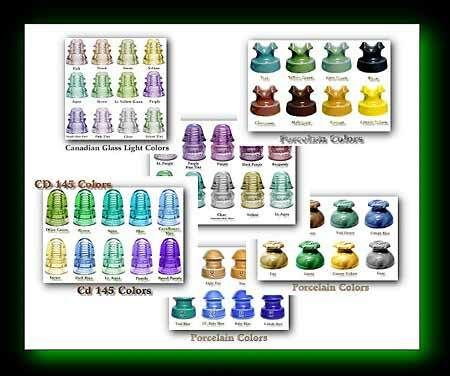 There are even colors listed for porcelain insulators!